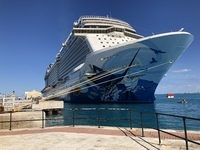 Went on this cruise with a friend and found it to be a better cruise than some others I had been on. Entertainment - especially "Choir of Men" was fantastic. Food available in quiet settings which was a good alternative to waiting in line. Pedicure was good but sales pitch for weight loss product throughout pedicure was horrible experience. (Found out later I could have requested she didn&apos;t do that, but shoudn&apos;t have to ask). Cabin very spacious and Casino had great lively staff. Stay in Bermuda was cut short, but wasn&apos;t much we missed out on except possibly a day trip to Hamilton. Went on RUM cruise and had a blast - beautiful sunset, delicious rum! Highly recommend that as a side trip. Did a "Cruise Critic" tour of rooms and LOVED the Haven suites! Definitely recommend the Haven for those who can swing them! Our family ocean view room was more than ample though! This vessel much larger than last Norwegian vessel which tells you how long it&apos;s been since I went on Norwegian! 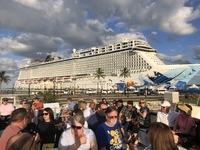 Went on this cruise with a friend and found it to be a better cruise than some others I had been on. Entertainment - especially "Choir of Men" was fantastic. Food available in quiet settings which was a good alternative to waiting in line. Pedicure was good but sales pitch for weight loss product throughout pedicure was horrible experience. (Found out later I could have requested she didn&apos;t do that, but shoudn&apos;t have to ask). Cabin very spacious and Casino had great lively staff. Stay in Bermuda was cut short, but wasn&apos;t much we missed out on except possibly a day trip to Hamilton. Went on RUM cruise and had a blast - beautiful sunset, delicious rum! Highly recommend that as a side trip. Did a "Cruise Critic" tour of rooms and LOVED the Haven suites! Definitely recommend the Haven for those who can swing them! Our family ocean view room was more than ample though! This vessel much larger than last Norwegian vessel which tells you how long it&apos;s been since I went on Norwegian!